Firehouse bacon is a three alarm wake up call to the mouth. Our spiciest bacon, not for the weak of heart or tongue. 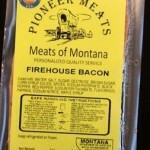 Exclusively at Pioneer Meats in Big Timber, Montana.